Rome, Italy – The search for survivors of a bridge collapse continued into the night in the northwestern Italian city of Genoa, as citizens began to mourn the victims and calls for an investigation grew louder. 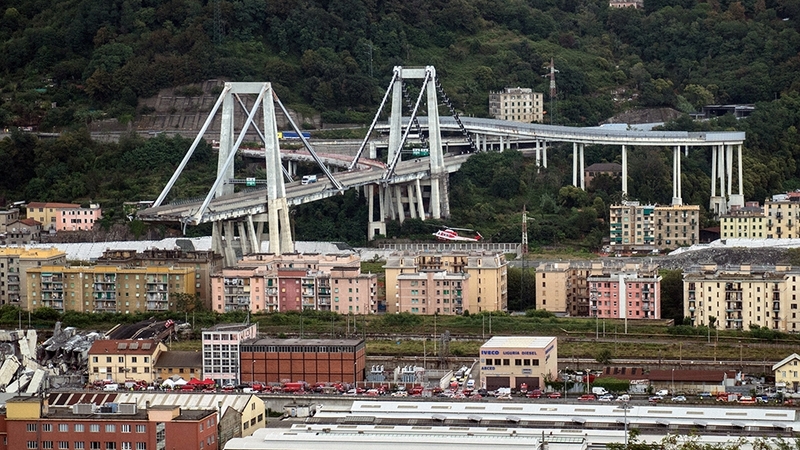 A 200-metre section of the Morandi bridge, part of a toll highway that was one of the main arteries into the port city, collapsed at about 12pm local time on Tuesday, taking down with it at least 30 to 35 cars and three lorries that had been crossing the bridge at the time, according to Italian news agency Ansa. At least 35 people had been reported dead, including a 10-year-old. Five of the injured were in a serious condition at the time of writing. The death toll is expected to rise as rescuers are still searching for bodies and survivors amid the rubble. 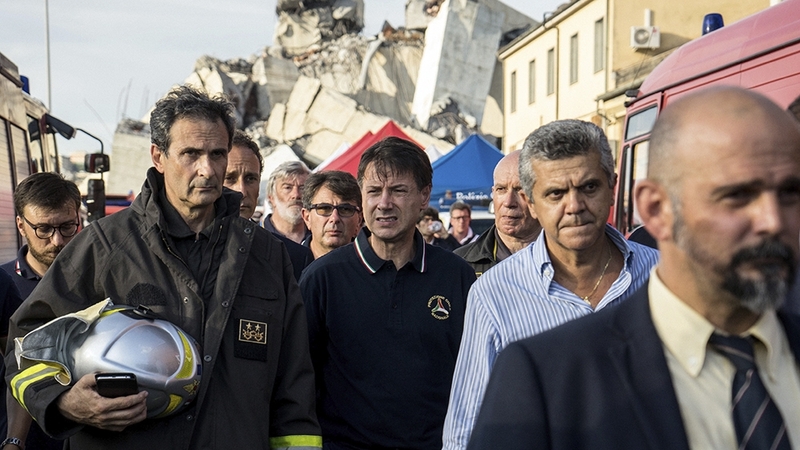 According to Italy’s civil protection department, around 1,000 police, firefighters and volunteers were deployed to the scene. Houses in the immediate vicinity have been evacuated out of fear that the two remaining sections of the bridge would also give way. “I heard a rumble and I fell down,” a surviving truck driver told the Italian daily Corriere della Sera. 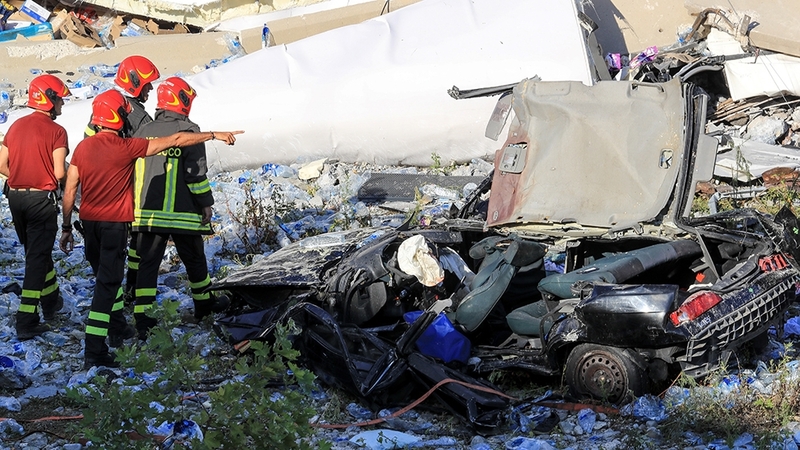 A footballer, Davide Capello, who had been driving on the bridge, said it was a miracle he was still alive. The reasons for the collapse have not yet been established. Authorities have promised a swift investigation. The 1,182-metre structure was inaugurated in 1967 and went through major reinforcement work in the 1990s. Ansa cited a 2011 report by Autostrade per l’Italia, the Italian highways company, as saying that the bridge had been suffering from decay. “Queues of cars and the volume of traffic provoke intense decay of the Morandi viaduct structure on a daily basis in the rush hours as it is subject to major demands,” the report said, adding that the bridge was for this reason in need for continuous maintenance work. Il Sole 24 Ore, Italy’s financial newspaper, reported that the company had launched a 20-million euro call for tenders in April 2018 for “structural retrofitting” of the bridge. The document said piers nine and 10 – the vertical structures holding the bridge up – were to be reinforced, while pier 11 had been strengthened in the 1990s. After a pre-selection of the companies came to an end on June 11, winners would be selected by September. Pier nine was involved in today’s collapse, according to the newspaper. After the incident, the company said that reinforcement work had been ongoing involving the bridge’s foundation, and that “the causes of the collapse will be scrupulously analysed as soon as it will be possible to safely access the scene”. A bystander, Pietro M., told Ansa news agency he saw “lightning strike the bridge” just before the collapse, as a wave of bad weather was sweeping through Italy at the time. Discussions and calls for a thorough inquiry soon came to have political undertones. Transport minister Toninelli said in a TV interview that “the first major intervention by this government will be to carry out ordinary maintenance of the infrastructure that already exists,” while far-right Interior Minister Matteo Salvini said he wanted “names and surnames of those responsible”, adding that austerity measures imposed by the EU may have led to budget cuts that caused local authorities to save on maintenance costs. Opposition leaders said the two politicians were exploiting the tragedy for political gain. A screenshot of a press release from the Five Star Movement’s website, where local activists opposed to the highway’s proposed expansion referred to the potential collapse of the Morandi bridge as a “fairy tale”, was shared widely on social media. The page, which now appears to have been removed, dates back to April 2013. In December 2012, the Genoa city council had discussed the state of the bridge in a public hearing. Giovanni Calvini, the local president of Confindustria, the general confederation of Italian Industry, had stated in a newspaper interview earlier in the same month: “When in 10 years the Morandi bridge will collapse, and all of us will have to be stuck in traffic for hours, we will remember the names of those who now say ‘no’ [to the expansion]”.